If Kohli chases well, India sleeps well ! These are certain set of traits that very few of us can proudly stake a claim to. Well that’s Virat Kohli for you- Epitome of a modern day cricketer. Virat means mammoth in Hindi. Kohli indeed is mammoth in terms of his technique, his ability to chase skilfully and win matches for the team. A focused head over his shoulders with a sense of maturity beyond his brash demeanour, Kohli reads the game like an Indian mom who can effortlessly manage a supper of 10 people with utter grace and delicacy. His resonant cover drives are as proficient as his majestic punches and flicks through the on side. Branded as the angry young man of a youthful Team India, he wears his emotions on his sleeve. Not only has he brought in new dimensions and stability to the Indian batting line up, his glorious energy in the field has raised the bar as well. What separates champions from the good players is the fact that they stand out as the purple bulls. Yes! I would call him a purple bull because of two reasons. First because has been consistently delivering for team India over the years and has also got the tag of a Run Machine. Secondly, the way he soaks pressure and rages the ranks of his opponents through his astonishing dexterity while chasing in crunch situations. Game after game, he has put victory in the Indian kitty. He is the man every Indian looks up to when he sees a target of 300+ on the screen. In 63 innings when batting second, Kohli averages 62.77 at a strike rate of 89.23, with ten centuries, an average of 6.3 innings per hundred. So far in his career, Kohli has scored 65% of his ODI runs in chases; the corresponding percentage for Sachin Tendulkar is 47%, for MS Dhoni its 44%, for Viv Richards 45% and for Brian Lara 52%. This has made him India’s best chaser, with a stunning average of 64.68 while batting second. “I sort of like batting under lights, If I have a target on the board, it is always easy to analyse how many runs you need in, say, a Power play, or what sort of situation you are playing in. I always like a target on board and sort of analyse my game and sort out how I want to go about it.” – Kohli says when asked how he strategizes to go about batting second. I think hunting targets has become a habit for him. Sometimes I feel he is playing with a cheat code, programmed to chase triumphantly ; the way kids do when playing in the simulator. He has been around for only five years in one-day internationals, but Kohli has set such an incredible pace with his landmarks that he is already joint third in terms of hundreds when batting second. Only Sachin Tendulkar, with 17, and Chris Gayle, with 11, have more centuries in chases than Kohli’s ten. Well comparisons with the greats are bound to happen when you are in such sublime touch but I feel it shouldn’t be the case with Kohli. He is such an uncanny character and is a divine force in itself that if you try comparing him with anyone you would eventually feel that you aren’t doing the justice to the latter. He is not the next Sachin or Viv Richards. He is the first Virat Kohli. Martin Crowe believes “Kohli has the intensity of Rahul Dravid, the audacity of Sehwag and the extraordinary range of Tendulkar”. So does I! Virat is class, glamour and substance packaged in a single cricketer. He has got excellent footwork and above all, the stamina due to which it becomes very difficult for any bowler to get him out especially once he is settled. This is evident in his batting average which is 52.16 in ODIs, 46.51 in Tests and 43.63 in T20s which clearly puts him far above his contemporaries. Former Australian captain Ian Chappell described Virat Kohli as the ”prince” of Indian cricket and said that the youngster will go on to break Sachin Tendulkar‘s records. Ravi Shastri says “Kohli is now a yardstick of reliance”. Reason 2: If someone messes up with him, he gives it back onto his face. I believe Australian fans would fall under this segment. Ozies it’s not the same team India anymore, who would fall prey to your stupid sledging gimmicks. You hit us once, we hit you back twice. Folks get ready to get the standing ovation of Virat’s middle finger again if you try provoking him the way you did at SCG in 2012. Reason 3: He is still a better batsman than all the batsmen of your team combined. Virat Kohli has scored (13) more hundreds than the cumulative count (11) by team Pakistan since 2011.Pakistanis would surely hate him for that. Reason 4: Dedication towards the game! Nothing matters more to him than cricket. He doesn’t play for money or respect. 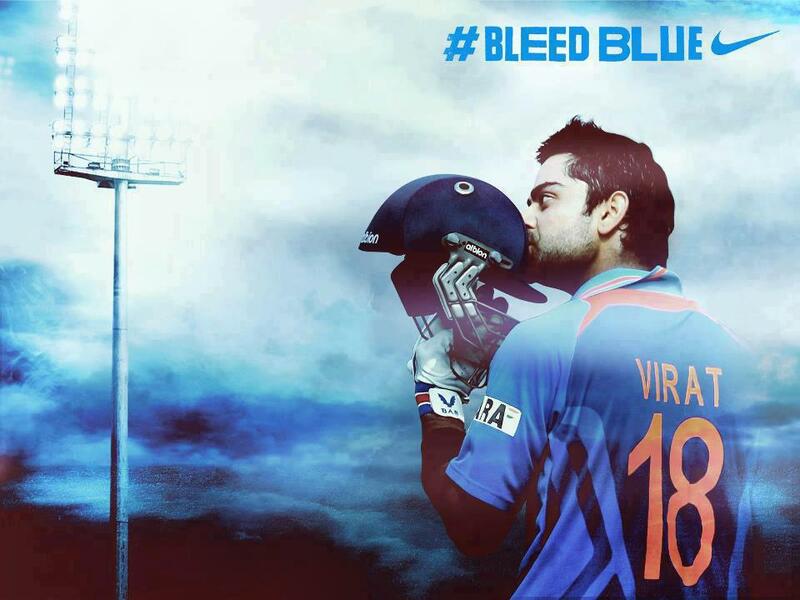 Virat only plays for his nation. The fact that he went onto play the game next day, when his father died shows his commitment towards the game. Bookies I am sorry .He is not the man you can bribe. Reason 5: Virat makes top class bowlers look paltry. “For sheer class and audacity, this knock of Kohli will stand out in the annals of cricketing history for eternity. He will cherish this knock – something he can tell his grandchildren (133* vs. Sri Lanka in CB Series, Hobart, February 28, 2012) “.His rampage caused India to achieve the target in only 36.4 overs. Reason 6: Neither is he a superhero nor is he worshipped! He is expressive. He abuses. He shouts. He has temperamental issue like a normal human has. I agree he doesn’t keep his emotions under check at times and crosses the line by swearing on the opponent’s mother and sister but that is how he is. I mean it’s always good to be hated for who you are, rather than being loved for who you are not. a) Most centuries by a player in ODIs. Currently Sachin holds the record 49 centuries in 463 games whereas Virat has already hit 19 in 134 games. Currently Michael Bevan is leading the chart with 53.58(6912/232) and Dhoni is on second spot. Considering the fact that Bevan doesn’t play anymore and Kohli bats at number 3; which gives him ample opportunity to get closer to the milestone with the kind of form he is in, definitely he can outplay Dhoni as well (who bats lower down the order). On his day, definitely he can score a ton in less than 36 balls. After that 52 ball ton against Australia, I think many of you would agree with this hypothesis. Reason 8: Kohli gives India the head start edge! He has matured pretty fast and is already looked upon as the safe successor for the next generation team while majority of other teams are still playing and being lead by aged fellows who serve more as accumulators rather than accelerators. So by the time they revamp their team, India would be roaring and leading the ratings. Reason 9: He is more popular than you or rather your favourite celebrity/cricketer! Currently he is the Election Commission’s national icon along the likes of Aamir Khan and the face of the youth in the Indian advertising sector. Reason 10: Not only is he the numero uno in the ICC ODI batsman rankings, he is heading the most eligible bachelor list as well! Recently when gave Kohli gave a CHOKE slam to the proteas in the ICCWorldT20 semi final, he got a marriage proposal from the English cricketer Danielle Wyatt on Twitter. God! This guy has some insane female fan following. “Sher hai Kohli India ka mere yaar, Abki baar Modi Sarkaar”! On a serious note, I think if he can continue the kind of form he is in and can cope up with fitness and injuries over the next 6-7 years; Virat Kohli will be the name to remember for the next 10 generations to come at least. This entry was posted in Cricket and tagged Anushka Sharma, Bleed Blue, Brian Lara, Chappel, Chase, Dravid, glamour, hate, India, Malinga, Martin Crowe, Michael Bevan, Modi, MS Dhoni, Pakistan, RunMachine, Sachin Tendulkar, Sehwag, sleeps, Sri Lanka, Team India, Virat Kohli, Viv Richards, VK by lalitvijay. Bookmark the permalink. Great Research , analysis with your love with sports. Flame is On . That’s really good. Thank you Navdeep. For me;cricket is not just a game,it’s a larger than life thing. I shall keep writing and sharing.